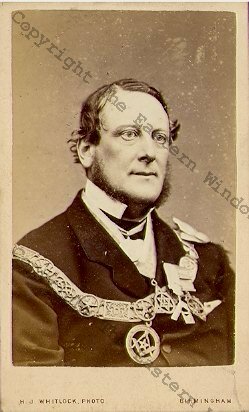 William Henry Leigh (1824-1905), 2nd Baron Leigh of Stoneleigh. Son of Chandos Leigh and Margarette Willes. He married Lady Caroline Grosvenor. His brother was Edward Chandos Leigh a First class cricket player. Cdv by H.J. Whitlock, Birmingham. ab. 1880. Size ab. 3,5 x 2 1/4 inches (photo) and 4 1/8 x 2,5 inches (mount). (showing slightly matt when holding at an angle). Original is sharp and darker brown toned (scan shows a bit greenish).